Taguchi, Tanahashi, ZSJ and Ibushi advance to the next round! 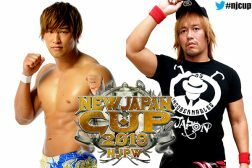 New Japan Cup Night 4 – Full Card released! Archer, Nicholls, Ospreay and Okada advance to the next round! New Japan Cup Night 3 – Full Card released! YOSHI-HASHI, Taichi, Owens & Ishii advance to the next round!